The lodge building of the Albany Eagles at Broadalbin Street and Water Avenue. 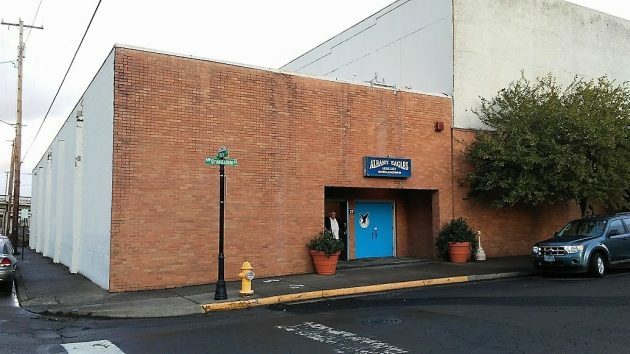 Albany’s urban renewal advisory board on Wednesday authorized its staff to talk to the Albany Eagles about possibly buying their lodge building, assuming the property comes up for sale. The windowless box at Water Avenue and Broadalbin Street sits on a site which a plan prepared for the Central Albany Revitalization Area in 2011 designated as a key location to provide more downtown parking, first with a ground-level lot. As parking needs grow, the plan suggested, the site could hold a four-level structure with spaces for 346 cars. Linn County tax records show the structure was built in two stages, in 1950 and 1968. Though the property is nontaxable, the county lists its value at $952,520. This story has been edited to reflect that Eagles members dispute as untrue the idea that they had authorized putting their building up for sale. I am confused, and interested in this Cara program,how it came along, how it is funded, just where do they get all their (money?). Can someone explain it to me?! If all of Downtown is funded by that, why isn’t there any money to fix the other parts of town? Urban renewal areas like the Central Albany Revitalization Area (CARA) are created by cities or counties to improve blighted areas suffering from a lack of investment. Albany’s historic downtown was determined by the city council in the late 1990’s to be blighted and an urban renewal district, CARA, was created in 2000 to help stimulate investment. Oregon law requires a city to develop an urban renewal plan that includes projects to address problems within the area. Any property taxes resulting from increased value from the date the plan is adopted are directed to the district rather than to existing taxing districts such as the city, county, school district, etc. If there is no increase in property values as sometimes happens, then CARA receives no money. Districts expire when they have incurred and repaid a specified amount of debt, usually within 20-25 years. Albany’s downtown is a good example of a district that has accomplished many of the council’s original goals. By attracting private investment at a rate of roughly $7 private for every $1 of public investment, buildings have been built, renovated or otherwise improved and significantly increased in value. When the District expires in a few years, all taxing districts will receive a much larger amount in property taxes than they would have if CARA had not been formed. Previous urban renewal districts in Albany were used to improve other parts of town by installing infrastructure. Additionally, Albany has used economic development funds from various sources to support projects throughout the city. Companies like W.R. Grace, ATI, Viper NW and Ameritool to name a few, have received tax abatements or subsidies to create jobs and improve or expand facilities. My association with Albany goes back many years and I think the most telling evidence of the value of CARA is a walk through the downtown. New shops, restaurants, houses, apartments and attractions like the Carousel have returned life and investment to an area that lacked both a decade ago. Michelle, here is a brief overview of CARA. To get its money, CARA uses Tax Increment Financing (TIF) to fund pet projects desired by the city council. This means CARA puts Albany residents millions of dollars into debt without voter approval by issuing urban renewal bonds. CARA then spends the bond proceeds on the council’s pet projects. The stated purpose is to eliminate “blight” in the downtown area, but “blight” is a moving target. It has no real meaning given CARA’s past spending decisions. The theory becomes very abstract when the pet projects are public improvements, meaning the improved property generates no property tax revenue (like the Eagles building, in this case). The theory asserts that privately-owned properties downtown will increase in value enough to justify the “investment.” That’s the theory, anyway. Now…enter the hard reality where theory doesn’t operate. To pay the bond principal and interest, CARA must skim property tax revenues away from the other taxing districts. This means money will be taken from essential services like police, fire, library, parks, education, and 4H. We sacrifice essential services for CARA’s pet projects. As a former Albany property taxpayer, I objected that CARA siphoned my property taxes away from their intended use. For example, I paid my taxes to the city to provide law enforcement and fire services. I didn’t pay my city tax for CARA projects. Every time CARA skims tax revenue away from its intended use a breach of faith happens with Albany taxpayers. If the city wants this building, let the project compete for funding from the city’s general fund. At least then you can have an honest debate about city spending priorities. One last thing. Several years ago Albany residents passed a local measure that requires the City Council to get voter approval before a future urban renewal district can be created. Voters should always have the last word on debt and spending schemes like CARA. Should have stuck around Gordon, things are just getting good. You left a lot of money on the table. Michelle – Hasso and other of his readers can answer with more knowledge than I. Basically, CARA is funded through tax dollars. The money is then reserved for reinvestment in the core of the city (downtown and historical neighborhoods). The premise is that the reinvestment will increase property values and thus increase tax revenues. Only specific projects get funded (or partial assistance) and CARA selects based on the merits of the project. I agree with councilman Kellum. Downtown parking may be important, but a 346 spot garage seems far off in the future. Oh Michelle, you are going to bring out all the usual suspects. CARA: The mayor’s slush fund. Funded and paid for by you and me. You want to see urban blight???? Take a look at the alleys in the downtown area!! Pretty up the streets but leave the ugly alleys alone. No one sees them anyway.